Shout out to showbiz reporter and sycophant Dan Wooten. If it wasn’t for him, I would have totally forgotten about this pointless annual event. The GLAMOUR Women Of The Year award ceremony happened earlier this week at Berkeley Square Gardens, London. Columnist: Caitlin Moran – Doesn’t she write for the Daily Mail? Comedy Actress: Kaley Cuoco Sweeting – Never heard of her. Radio Personality: Fearne Cotton – Is Fearne still considered a radio personality? Accessories Designer: Anya Hindmarch – Never heard of her. Next Breakthrough: Suki Waterhouse – Never heard of her. TV Personality: Rita Ora – When did Rita Ora become a “TV personality? Isn’t her occupation singer/ girlfriend to the stars? Presenters: Claudia Winkleman and Tess Daly – Congratulations. Sportswoman: Laura Trott – Congratulations. Clothes Designer: Mary Katrantzou – Never heard of her. Writer: Paula Hawkins – Never heard of her but I will check out her work. Cointreau Solo Artist: Ellie Goulding – Why? Film Actress: Felicity Jones – Never heard of her. Glamour Trailblazer: Amy Schumer – Never heard of her. Theatre Actress: Gillian Anderson – Congratulations. Man Of The Year: Calvin Harris – The man loses weight, purchases a six pack, cuts/lightens his hair, grows facial hair, starts dating Taylor Swift and suddenly he’s considered ‘Man Of The Year’. PLEASE! Editor’s Special Award: Ellie Kemper – Never heard of her. 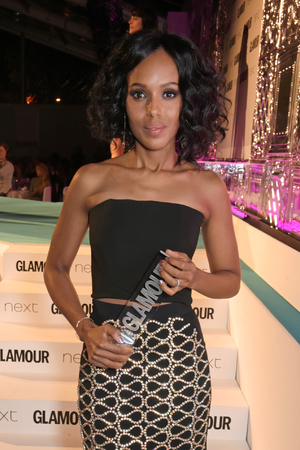 International TV Actress: Kerry Washington – Congratulations. Entrepreneur: Kate Hudson – *confused face* Kate has an acting career thanks to her mother Goldie Hawn. What else does she do??? “never heard of her” – lol! “girlfriend to the stars” – LMAO! Kate Hudson has launched a very successful fitness apparel sportswear line called, Fabletics. you may have seen the advert on TV and several ads on social media. Kaley Cuoco Sweeting is the actress from The Big Bang Theory. The ratings for that show is through the roof, so thats probably why shes being recognised. Suki Waterhouse is the newest emerging model hitting the runways. Your bang on with Fearne Cotton though!! Mary Katrantzou is known for her great print work in fashion, very similar to Peter Pilotto. That’s Kate Hudson’s line??? Well you learn something new everyday.